Birthplace : Houston, Texas, U.S.
Patricia "Pat" Parker born January 20, 1944 in Houston, Texas, United States - died June 4, 1989 in Oakland, California, United States was an African-American poet and activist. 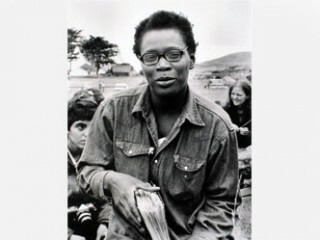 "This loud and rich-mouthed poet," Lyndie Brimstone writes of Pat Parker in Feminist Review, "who planted her feet firmly on platforms all over America and demanded that her audiences, whoever they may be, pay attention, was not only working class, she was black and lesbian: the very first to refuse to compromise and speak openly from all her undiluted experience." Parker was a contemporary of such writers as Audre Lorde, Adrienne Rich, and LeRoi Jones/Amira Baraka. Until her early death from cancer in 1989, she was not only a highly visible black Lesbian poet--Adrian Oktenberg, writing in the Women's Review of Books, called her "the poet laureate of the Black and Lesbian peoples"--but a committed activist in radical politics and community issues. In addition to urgent, angry poems against racism, sexism, and homophobia, Parker wrote "exquisitely sensual love poems," Brimstone reported. In a Callaloo review of the 1978 collection Movement in Black: The Collected Poetry of Pat Parker, which includes poems from her earlier books, Gerald Barrax commended Parker's qualities of "wit, humor, and irony" but suggested that her work often falls into "rhetoric, sentimentality and didacticism." He particularly praised the autobiographical poem "Goat Child" for its "ease, speed and charm." Brimstone termed the same poem "a courageous, sinewy work" and "a fine example of Pat Parker's skill." In her review of Parker's final book, Jonestown and Other Madness, Oktenberg suggested that if Parker's poetry is "simple," it is "deceptively so." "She gets down on paper complicated states of feeling, lightning-quick changes of thought, and she deals with complex issues in language and imagery that any bar dyke can understand," Oktenberg said, adding, "You don't have to have an education in poetry to read [Parker's work], though the more you have, the better the work becomes." Parker's "standpoint as a black lesbian mother," Rochelle Ratner commented in Library Journal, "imbues her poetry with a highly political consciousness." The feeling and vision behind Pat Parker's poetry may perhaps be summed up in the closing lines of the first poem in Jonestown and Other Madness: "I care for you / I care for our world / if I stop / caring about one / it would be only / a matter of time / before I stop / loving / the other." On the tenth anniversary of Parker's death, and the twenty-first of its original publication, Movement in Black was re-issued in 1999 in an expanded edition that included more poems (some previously unpublished), ten tributes by other writers (mostly black lesbian activists), and a new introduction by Cheryl Clarke. Echoing the comments of earlier reviewers, Clarke dubbed Parker a "lead voice and caller" of the lesbian-feminist movement. While criticizing Parker for careless editing, Clarke suggested that this fault may have been intentional on Parker's part, reflecting the author's fear that her poems would lose their vernacular power if they were subjected to extensive critical attention. This vernacular consisted of short rhythmic lines (sometimes rhymed; sometimes not) that relied not on the strength of original images or language to achieve its effect, but on an inspired resolution or punch line. For example, Parker's description of making love to a women in "For Willyce": "and your sounds drift down / oh god! / oh jesus! / and I think / here it is, some dude's / getting credit for what / a woman / has done / again." Reviewing the expanded edition of Movement in Black for Booklist, Ray Olson refered to Parker as a "people's poet. . . .[d]eeply political and democratic" whose work spoke not only to black lesbians, but "opened that identity to anyone with ears to hear, eyes to read, and a heart to respond." Olson pointed out that the response Parker often received at her dramatic readings "could rock the house," and concluded: "Her work still has that kind of power. It should be considered simply an American classic." Family: Born January 20, 1944, in Houston, TX; died of cancer, June 4, 1989; daughter of Ernest Nathaniel (a tire retreader) and Marie Louise (a domestic; maiden name, Anderson) Cooks; married Ed Bullins, June 20, 1962 (divorced, January 17, 1966); married Robert F. Parker, January 20, 1966 (divorced); children: Cassidy Brown, Anastasia Dunham-Parker. Education: Attended Los Angeles City College and San Francisco State College (now University). Politics: "Black Feminist Lesbian." Memberships: Gente. WIM Publications Memorial Poetry Award established in her name. Worked variously as a proofreader, proof operator, waitress, maid, clerk, and creative writing instructor. Director, Feminist Women's Health Center, Oakland, CA, 1978-89; founder, Black Women's Revolutionary Council, Oakland, 1980. * Child of Myself, Women's Press Collective, 1972. * Pit Stop: Words, Women's Press Collective, 1974. * Movement in Black: The Collected Poetry of Pat Parker, 1961-1978 (includes work from Child of Myself and Pit Stop), foreword by Audre Lorde, introduction by Judy Grahn, Diana Press (Oakland, CA), 1978, expanded edition, introduction by Cheryl Clarke, Firebrand Books (Ithaca, NY), 1999. * Woman Slaughter, Diana Press, 1978. * Jonestown and Other Madness, Firebrand Books, 1985. * Where Would I Be without You: The Poetry of Pat Parker and Judy Grahn (audio recording), Olivia Records, c. 1976. Also contributor to Plexus, Amazon Poetry, I Never Told Anyone, Home Girls; This Bridge Called My Back: Writings by Radical Women of Color, edited by Cherrie Moraga and Gloria Anzaldua, Women of Color Press, 1981; and other anthologies, magazines, and newspapers.